The Congressional Budget Office’s (CBO) latest projections of budget and economic conditions over the next ten years indicates the economy will grow slowly this year at a 1.4 percent rate after being adjusted for inflation. CBO attributes the short term slowdown to the recent fiscal cliff deal that raised tax rates and the Budget Control Act that will reduce spending beginning March 1. In subsequent years, CBO expects these fiscal drags to dissipate and the economy to recover at a faster pace, due largely to a rebound in the housing market. However, the higher tax rates are here to stay, and CBO has apparently failed to account for the extent to which these tax increases will reduce long term investment, hiring, and work. As it is, CBO expects the budget deficit to shrink this year to $845 billion, or 5.3 percent of GDP, which would be the first deficit under $1 trillion since 2008. They expect deficits to continue shrinking to about 2.4 percent of GDP by 2015 and to grow after that, reaching 3.8 percent of GDP in 2023. They expect publicly held debt to reach 76 percent of GDP this year, fall to 73.1 percent by 2018, and then continue on an upward trajectory, reaching 77 percent of GDP in 2023. CBO is right to point out that these would be the highest U.S. debt levels since the years immediately following World War II and that the various dangers of such indebtedness include an interest rate spike that would precipitate a fiscal crisis and even default. However, it could be worse and likely will be. Under the CBO’s alternative scenario, which assumes current policy will continue and that automatic spending cuts will not go into effect on March 1, the debt to GDP ratio reaches 87 percent by 2023. Further, as will be demonstrated, CBO likely overestimates long-run economic growth and new tax revenue resulting from recent increases in tax rates. This means deficits will likely be larger and debt will likely exceed the 77 to 87 percent range foreseen by CBO. While federal tax revenue has been depressed since the 2008 downturn, CBO projects revenue will recover abruptly over the next few years from 15.8 percent of GDP in 2012 to 19.1 percent in 2015. They expect revenue to remain at about 19 percent of GDP thereafter, which would be about 1 percentage point higher than the forty year average of 18 percent (See Figure 1). 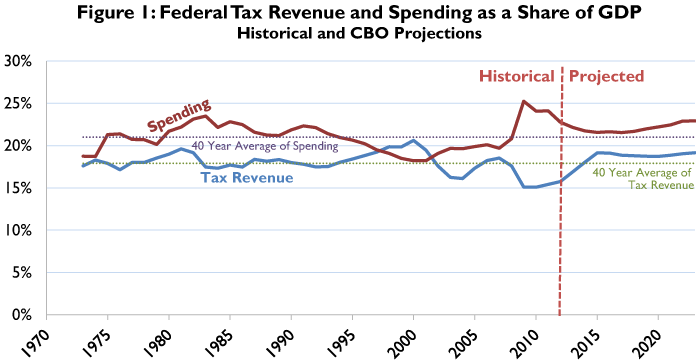 Figure 2, below, shows tax revenue by source as a share of GDP using historical and CBO projected data. Revenue increased in 2012, largely due to a 34 percent increase in corporate tax revenue stemming from record profits and less generous tax treatment of business expenses. Businesses could write off 100 percent of expenses related to equipment and software in 2011 versus 50 percent of those expenses in 2012. As a share of GDP, corporate tax revenue was 1.6 percent in 2012, slightly lower than the forty year average of 1.9 percent. 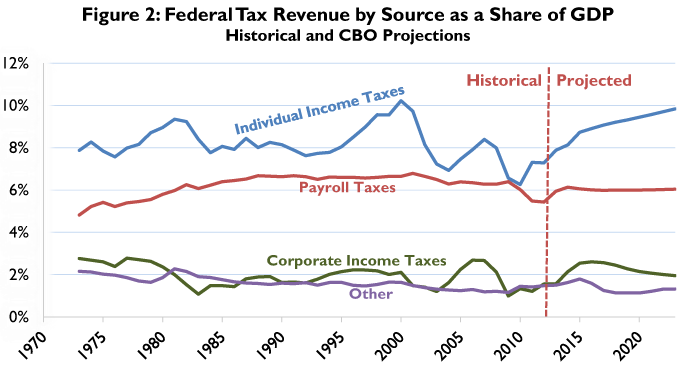 CBO expects profits and corporate tax revenue to remain flat in 2013. Thereafter, CBO projects corporate tax revenue to grow to about 2.5 percent of GDP in 2015 due to expiration of various provisions, including 50 percent expensing and the research and development credit. By 2023, CBO expects corporate tax revenue to return to roughly the long run average of 1.9 percent of GDP. As a result of the second year of the payroll tax holiday, continuing high unemployment, and a shrinking labor force, payroll tax revenue remained flat in 2012 at 5.4 percent of GDP, lower than any year since 1977. With the expiration of the payroll tax holiday, CBO expects revenue to reach 5.9 percent of GDP this year, but high unemployment and a shrinking labor force will prevent this revenue from increasing much beyond that. CBO expects the big growth in tax revenue to come from individual income taxes, although the next section of this paper will demonstrate that these new revenues are likely to prove elusive. After rebounding considerably in 2011, individual income tax revenue remained flat in 2012 at 7.3 percent of GDP, but CBO expects that to grow to 7.9 percent of GDP this year due to growth in income and the new higher tax rates on high-income earners and investors. CBO projects individual income tax revenues to increase steadily thereafter to 9.8 percent of GDP by 2023, which would be the highest level on record except for the 10.2 percent level in 2000. Contrary to CBO projections, the evidence indicates higher tax rates, at least on investors, actually reduce income and tax revenues. The top capital gains tax rate was just raised from 15 percent to 23.8 percent. The last time this tax rate was increased was in 1986, when it was raised from 20 to 28 percent. CBO projected then that capital gains realizations and tax revenue would drop for one year but rebound thereafter. 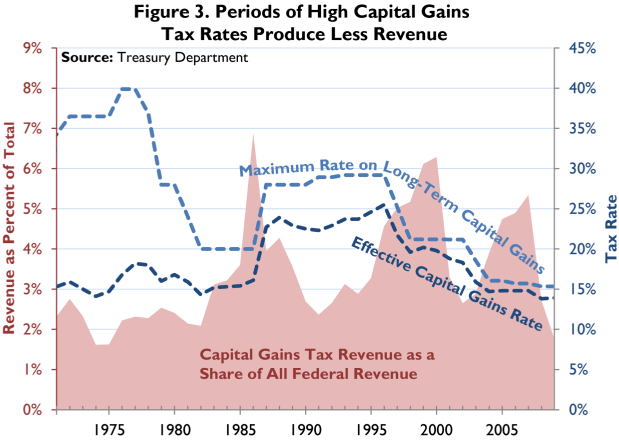 In fact, as Figure 3 shows, based on Treasury data, capital gains realizations and tax revenue remained depressed for ten years until the tax rate dropped once again to 20 percent in 1997. This occurred partly because investors can relatively easily shift their buying and selling of assets across time to minimize taxes. CBO acknowledges that this effect was in play at the end of last year when investors shifted billions of dollars of capital gains realizations from 2013 to 2012 to take advantage of last year’s rates. However, CBO does not project out this effect beyond one year. Nor does CBO account for the long term slowdown in capital gains realizations resulting from less investment, which is the larger effect of higher capital gains tax rates. The Reagan era demonstrates that lowering the top marginal income tax rate can result in higher incomes and more tax revenue. 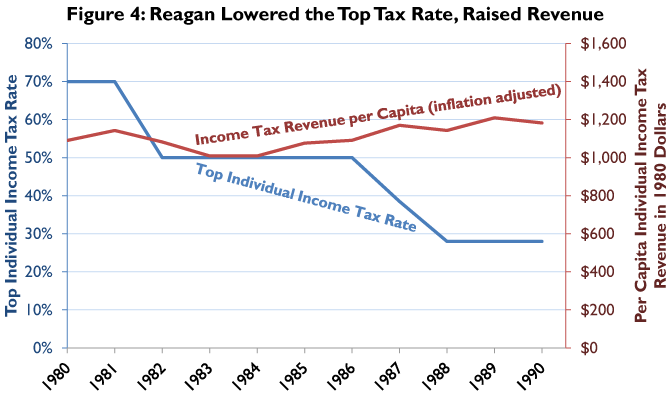 As Figure 4 shows, Reagan lowered the top marginal income tax rate from 70 percent in 1980 to 28 percent in 1988. Individual income tax revenue increased, even after adjusting for inflation and population growth. This effect is probably stronger now since the pass-through business sector has grown dramatically since the 1980s, such that a majority of businesses and their income are taxed under the individual code. Plus, about half of this pass-through business income is taxed at the new top marginal tax rate of 39.6 percent. The new higher tax rates for high-income earners, investors, and businesses means less investment and less productive labor. It is not apparent that CBO has accounted for these effects in their long run projection of “potential GDP.” CBO expects real GDP to grow about 2.3 percent per year after 2019, which is one point below the 3.3 percent average annual growth rate since 1950. CBO attributes the long-run slowdown to demographic factors such as the aging of the baby boomers and the shrinking of the labor force, as well as a smaller capital stock resulting from low levels of investment over the past few years. These are very real problems, as we have noted, but they are only made worse by recent tax increases on investment and high-productivity labor. Our model takes tax policy into account over the long run, and we find the new tax increases will shrink the economy 1.45 percent over the next five to ten years, as compared to what would happen under the tax rates that applied last year. As a result, we find the revenue gains from these tax increases are about one-third of what CBO projects. Due to these differences in assumptions about the effects of tax policy, our model predicts slower economic growth over the long run than CBO’s, all else equal. This likely means a longer period of high unemployment as well as subpar tax revenue. It also means larger deficits and a growing debt-to-GDP ratio that will exceed the 77 to 87 percent range CBO projects for 2023. CBO takes a sanguine view of the long-term effects of recent tax increases on high-income earners and investors. CBO’s long-term model of economic growth is driven by capital and labor, as it should be according to the standard neoclassical understanding. However, CBO wrongly assumes that capital and labor grow in the long run independently of taxes on capital and labor. Obviously, taxes are a cost and they should be taken into account in CBO’s model just as they are by investors, employers, and workers. Because of this omission, CBO underestimates the long-term drag on economic growth that will result from recent increases in the tax costs of investing, hiring, and working. If we assume CBO’s other assumptions about the economy are correct, that means economic growth will be slower and high unemployment and low tax revenue will persist longer than CBO predicts, probably beyond 2017. It also means larger deficits and a growing debt-to-GDP ratio that will exceed the 77 to 87 percent range CBO projects for 2023. Of course, any number of unpredictable things could happen to the economy, good and bad, so there will always be a great deal of uncertainty regarding long-term projections. However, tax policy is one thing that we can control, so it is critical that we understand, and incorporate into our models, the long-term economic implications. Congressional Budget Office, The Budget and Economic Outlook: Fiscal Years 2013 to 2023 (Feb. 2013), http://cbo.gov/sites/default/files/cbofiles/attachments/43907-BudgetOutlook.pdf. According to the latest 4th quarter GDP numbers by the Bureau of Economic Analysis. This despite the fact that CBO has recently reviewed the economic literature, which indicates that capital gains realizations are extremely sensitive to taxes, with elasticity estimates usually around -1, indicating a 10 percent increase in the capital gains tax rate results in a 10 percent decrease in capital gains realizations. That means raising the rate would raise no additional revenue. See Tim Dowd, Robert McClelland, & Antiphat Muthitacharoen, New Evidence on the Tax Elasticity of Capital Gains, Joint Working Paper of the Staff of the Joint Committee on Taxation and the Congressional Budget Office, June 2012, http://www.cbo.gov/sites/default/files/cbofiles/attachments/43334-TaxElasticityCapGains.pdf. Scott Hodge & Alex Raut, Individual Tax Rates Also Impact Business Activity Due to High Number of Pass-Throughs, Tax Foundation Fiscal Fact No. 314 (June 5, 2012), https://taxfoundation.org/article/individual-tax-rates-also-impact-business-activity-due-high-number-pass-throughs. U.S. Department of the Treasury, Office of Tax Analysis, Matthew Knittel et al., OTA Technical paper 4: Methodology to Identify Small Businesses and Their Owners, Aug. 2011, http://www.treasury.gov/resource-center/tax-policy/tax-analysis/Documents/OTA-T2011-04-Small-Business-Methodology-Aug-8-2011.pdf. William McBride, The Investment Slump Continues, Tax Foundation Tax Policy Blog, Jan. 30, 2013, https://taxfoundation.org/blog/investment-slump-continues. Stephen Entin, Measuring the Economic and Distributional Effects of the Final Fiscal Cliff Bill, Tax Foundation Tax Policy Blog, Jan. 2, 2013, https://taxfoundation.org/blog/measuring-economic-and-distributional-effects-final-fiscal-cliff-bill.